Hello there and welcome back! Today I am super excited to announce a new blog series and a nail challenge open to everyone. Earth Day is this month, and every year it sneaks up on me and I wish I could have used my platform to speak about it more. 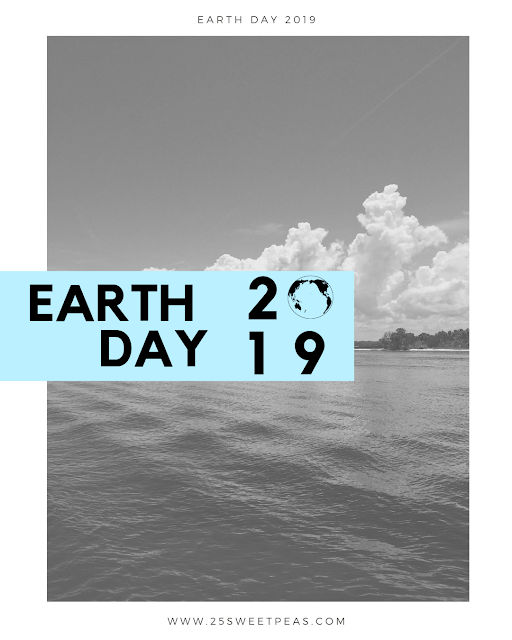 So in order to not let that happen I've been planning ahead and will be talking about and support Earth Day for the whole month with a new blog series. This new blogging series will consist of guest bloggers I admire from all over the world where we will share a fun mani and speak about the Earth in some way or another. This series will predominantly happen on Tuesday's and Thursday's but I've been lucky enough to have all of the dates fill up so the series will also spill into some weekends! Which I am so so excited for and thankful for because it just shows how we all really do want to help Earth, the place we all call home. Over the next so many weeks we will visit places all over the Earth and learn about different trouble spots/issues in those areas, how you can help in your daily lives, and so much more. While I know we will all be covering a lot of information I know we can't possibly cover it all which is why I would love to invite you to join in as well. Since spring is a busy time for most everyone I have two different ways for you to join in and be apart of my Earth Day month. Both of which listed and explained below! First up there is a 5 Day challenge that you can do at any point this month. 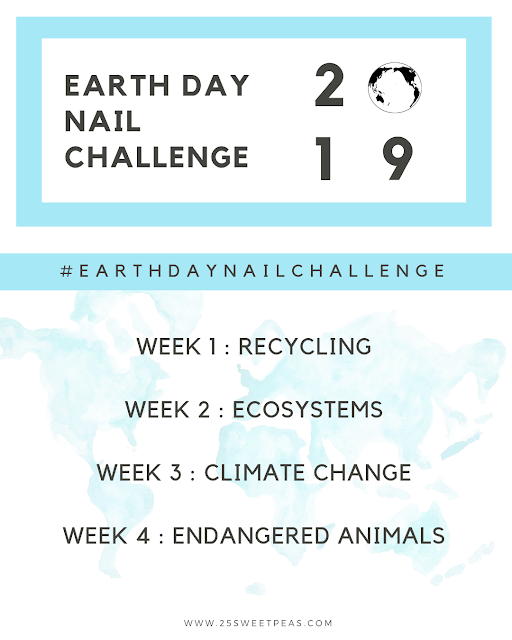 So you pick the week you want to join, follow the daily themes, and use the #earthdaynailchallenge tag when posting on Instagram so I can easily find them and feature them. Also automatically by posting in the hashtag your post will be put in the running to be featured in a big end of the month post right as we near Earth Day! Next we have a more relaxed weekly themed challenge that can be done numerous different ways. You can theme your whole week or nail art around that weeks theme, or you can just do a few manis based on that theme or hey, just do one mani based upon that theme weekly. Really you just do whatever variation of the challenge fits your life schedule at the moment. 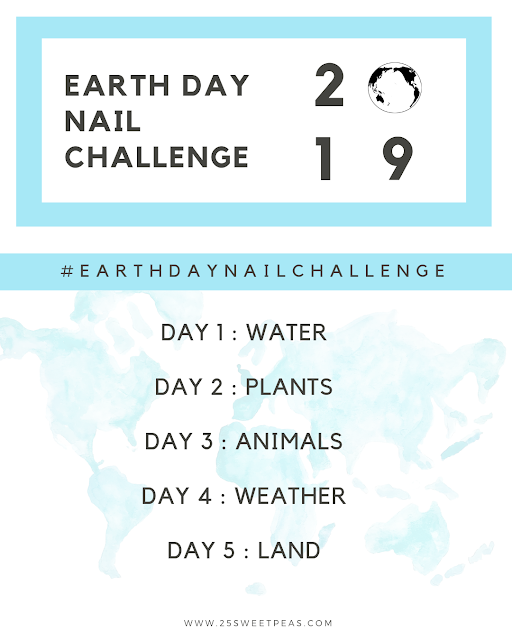 :) When posting use the #earthdaynailchallenge tag so I can easily find them and feature them. Like in option one, automatically by posting in the hashtag your post will be put in the running to be featured in a big end of the month post right as we near Earth Day! Overall the goal for this month is to show support in the nail community for the Earth. Start a conversation, all while having some fun nails to go along with. I will list a handful of ideas below to help you start thinking in case you are have "topic block" because I do really feel there are so many great things we could talk about this month. Really though just think about your area, the parts of Earth you love, the things we take for granted, how different Earth related things affect your daily life, or how you can do things/change things to help the Earth in the long run even if its a little things they all help and are a start. I'm planning on doing an Earth Day inspired mani, but so busy with life just lately! I wish my nail art skills were better! I look forward to seeing what you come up with. This is such a great idea! I’m going to try to do one this month. I always try to do earth day nails. I like the idea of adding endangered species. I love this idea. I can't wait to see what everyone comes up with.